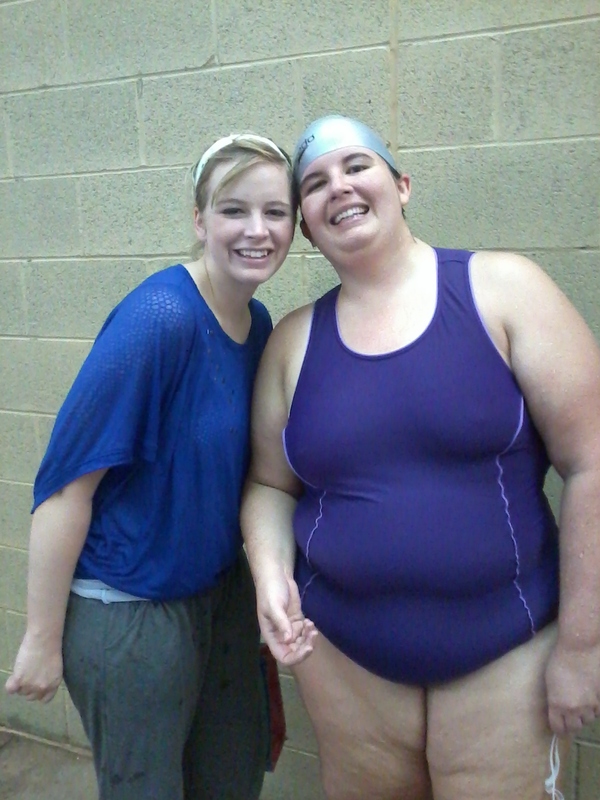 Today was the last swimming event of 2011. 😦 What a great year it has been! I seriously don’t know how I would have gotten through all of the challenges this year if I hadn’t rediscovered swimming. It has been the avenue to so many wonderful friends and (forgive me for sounding corny) but the emergence of a swim family in my life. I am so grateful to everyone that has volunteered, encouraged, befriend and swam with me! So, this meet was the biggest of the season and definitely the most crowded. I think there were 5 or 6 heats for the 50 free! It was great seeing a bunch of my swim friends; although, I wish more of the open water community came out for the meets. We miss you! I got to carpool up with my friends Kate and Erin. I should have taken a photo but it was wonderful to visit with them. It was also fun to see Josh (and win a free cap) and meet Matt fro the first time. I even was able to introduce myself to some new friends. I particularly love when people are swimming in their first race/meet. I feel almost like I did as a missionary welcoming a new investigator to church. I just want them to have a great experience and be welcomed by me, like I was welcomed by others. This meet was special because my sister Anna came up for it from Provo. She stayed the night in my guest room (which is open for any of you who want to visit!) and then she drove up for the meet. It was one of the first time’s that any of my family have been to a swim meet/race. Even in high school with a new baby it was hard to get family members out to my meets. It really meant a lot to me to have family cheering me on. She said it was one of the first athletic events she has ever been to where she’s been cheering for someone. I guess that says something on how athletic my family is! I was grateful for her presence. Thanks! I swam in 3 events and was nervous about my performance as practice has been quite brutal lately. Between my business trip and the tonsillitis I had gone 2 weeks without a swim. I was also taking a strong antibiotic called clindamycin which caused my blood sugars to be high and my whole demeanor to be low energy (not to mention my body was fighting off tonsillitis. When I went for my first swim last Friday it was brutal. My arms felt like weights, the water like glue. 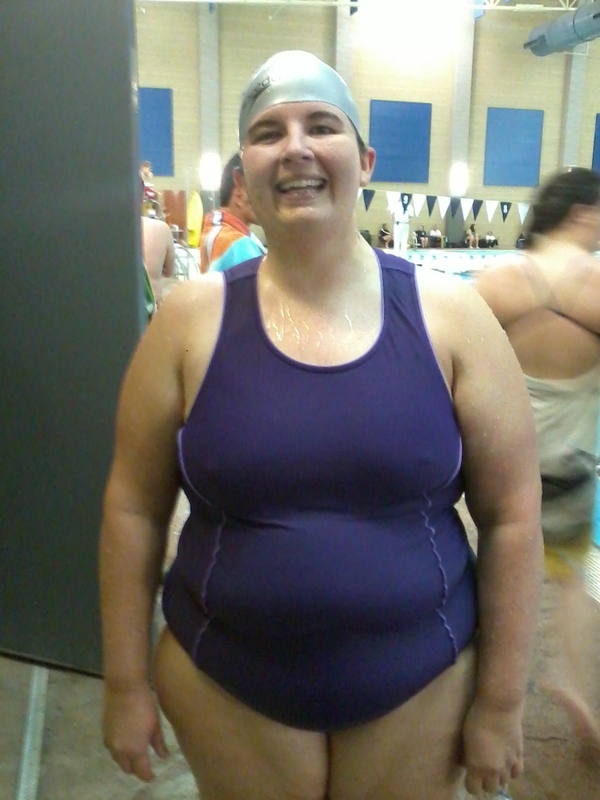 It was so hard to even get through a 200 m. Nevertheless, I pushed forward and swam/worked out every day this week. I am proud to say I had a 4 swim/5 workout week! I say this with particular pride because never were the routines more difficult to get through. At times it was very discouraging but I persisted on. I was still unsure whether I would have the energy to get through my races today. I didn’t’ want to re-injure myself as I am just today getting off the antibiotic but I wanted to do my best. Fortunately the first race was my 50 free. I was unaware my heat was starting and had to dash to the diving board. As I was climbing up they blew the whistle making me a few seconds behind on my start. My ending time was 52 seconds which I am happy with given the circumstances (my best is 49 seconds which I think I would have matched without the slow start). Next up was the 50 fly. I really had doubts on my ability to finish a lap of fly but I pushed through and completed my swim 5 seconds faster than my previous time! My last race was the 500 meters. It is the longest race of the day and a huge challenge. It may seem odd that a 500 would be hard when I’ve swam 1.2 miles. The pace is much faster and the addition of flip turns, which sap energy, makes it actually a little bit more difficult in some ways. Anna was my counter and I think I felt everyone’s encouragement. Still, by about lap 13 my legs were burning and my lungs felt heavy. I said to myself 3 laps left. You can do this! I would have been happy just to finish but I improved by about 20 seconds off of my last time! I’m so thrilled! this may be my favorite photo ever. I think it is such a genuine smile because I am so genuinely happy! Originally I had thoughts of doing the 200 meters but after the 500 I felt spent and I didn’t want to push my luck. Anna and I drove home and went to Cafe Rio where I downed a whole wheat chicken burrito (no rice, double beans!). It was a lunch well deserved. What a wonderful day with friends, family, and swimming. Perfect! I look forward to the QUAC meet in February. Wish there was one in January but I’ll have to make do with practice. Thanks again to everyone who helped with today’s meet and all of the Utah Masters and Utah Open Water events I’ve participated in. It is great! Great swim(s) Rachel. Your times keep getting better and better! See, I thought you might have a good swim. I’m glad that you improved so much. Congrats on all of the new personal-bests you set. Very cool indeed. I’m glad we were finally able to meet in person.